Mumbai: A pair of earrings we are sure you have not seen elsewhere! Stealing the hearts of the jury, ORRA was awarded the Best Diamond Jewellery for their stunning pair of jhumka earrings titled ‘Kathakali’ at the GJTCI Excellence Awards 2017. 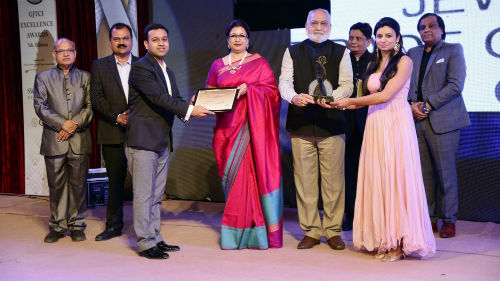 The gala event, now in its fifth year, recognizes the top brands from the Indian Gem & Jewellery Industry in areas various categories including retail and design. Inspired from the ostentatious, expressive, voluminous yet elegant, nature of the Kathakali dance and its costume, these finely crafted jhumkas by ORRA, are studded with brilliant cut and rose cut diamonds and rubies, in 18k yellow gold. Studded with over 1800 diamond pieces, and weighing an awe inspiring 145 grams in gold itself, this piece showcases the delicate intricacy with which the craftsmen at ORRA work. With a dedicated team catering to customized jewellery designs for the contemporary Indian consumer, ORRA continually works towards creating such awe inspiring designs for its patrons. Customers can visit any of the 32 stores across 21 cities to experience their designs or simply log onto www.orra.co.in and place their custom orders today!